Hi my name is Popeye. Well, it might as well be considering how much spinach I’ve been eating lately. I basically eat spinach every day. For real. I have spinach in salad every day for lunch and then I add more spinach to my diet for breakfast or dinner too in different ways as well. The Greek Quiche I recently made is a perfect option for either meal. Spinach is just so good for you. It is a low fat food that is high in fiber, protein. As well, it loaded with vitamins A, C, E and K, thiamin, vitamin B6, folate, calcium, iron, magnesium, phosphorus, potassium, copper, and manganese, niacin, and zinc. Flavonids in spinach also help as antioxidants to keep cholesterol from oxidizing and protect your body from free radicals. If heart health is a concern that spinach is your friend as it’s great for you cardiovascular system as the magnesium in it helps lower high blood pressure. Overall spinach is a great super food that can be enjoyed in juice form, raw, and cooked. It’s versatile nature makes it easy to incorporate into your healthy diet. 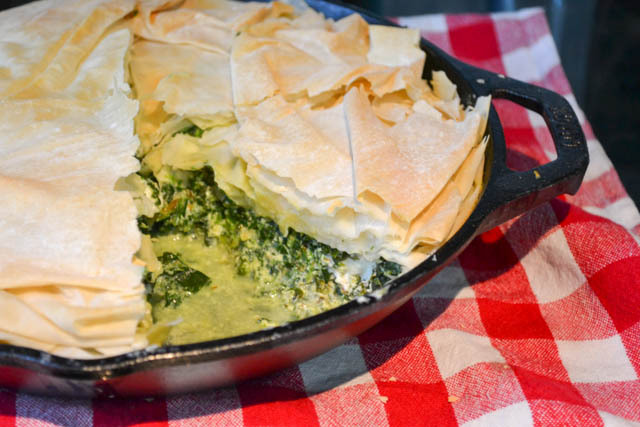 So, here I go again making another spinach packed pie! 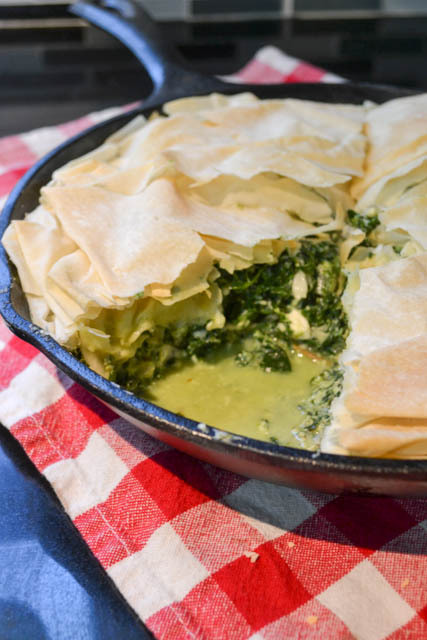 This is a fun play on Spanokopita in that it’s served just like a pie instead of the handheld triangles I normally see. They are great as well but I like this ratio of filling to phyllo much more in this pie. 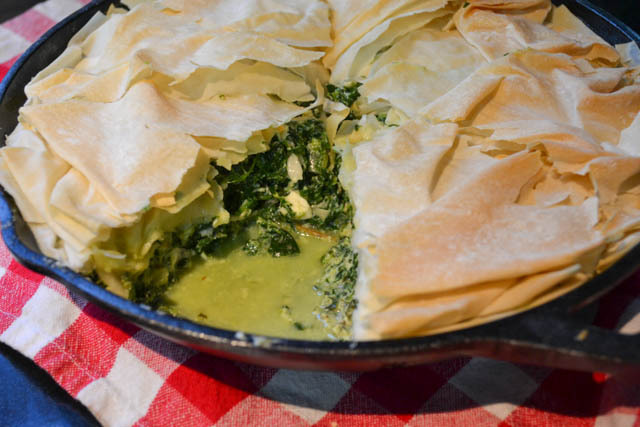 I just love spinach and feta so much so my craving is satisfied with this pie. The original recipe called for dill but I just don’t like dill that much so I added some oregano, which pairs well with Greek recipes, instead. Hope you enjoyed this week’s pie recipe! Get ready for a sweet treat for next week! In a 10-inch non-stick skillet, melt butter over medium heat. Once melted, reserve 2 tablespoons in a small bowl. Add the onion to the skillet and stir while cooking until softened, about 5 minutes. Remove the skillet from heat and let cool slightly. Stir in the spinach, ricotta, eggs, feta, oregano, crushed red pepper, salt, and pepper. Lay 1 sheet phyllo on a work surface and lightly brush with the reserved melted butter. Lay the sheet, butter side up, over the spinach mixture, folding edges under to fit inside skillet. (Keep the extra phyllo covered while you work.) One at a time, brush remaining 3 sheets and add to the top of the skillet, rotating and scrunching each sheet slightly so edges are offset and the top is ruffled. Bake for 25-30 minutes, until golden brown and heated through.